Shade presents a unique challenge for the garden enthusiast. We love our trees but the abundant shade created by leaf canopy makes for difficult growing conditions for nearby plants. Shrubs for dry shade feature those plants that tolerate lack of soil moisture with adaptations to accommodate these difficult growing conditions. Dry shade areas feature soil that needs regular amendments of organic material to promote plant health and a mulch base to retain water to assist the plants in acclimating to this difficult location. The fact that this ornamental shrub tolerates a wide range of soil and moisture conditions makes it the perfect choice for a dry shade garden. Showy foliage features a purple hue, especially on those plants situated in deep shade. Dense foliage appears after slight yellow flowers appear in mid-spring. Barberry grows quickly and is hardy in zones 4 to 8. 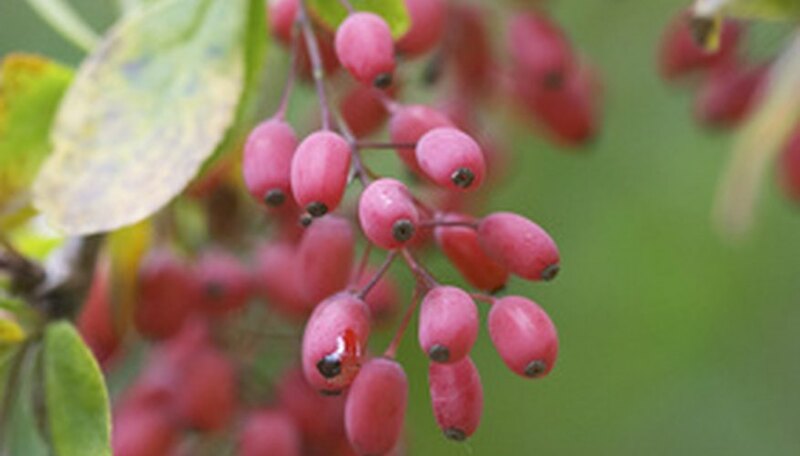 Look for beautiful red berries that last through winter. Branches feature sharp thorns and make this an excellent barrier plant for hedges or privacy. This shrub features many cultivars with sizes ranging in height from 3 to 6 feet. Showy foliage and berries provide plenty of stunning color in the shade garden. Yaupon features oval dark green leaves without the trademark sharp tips of the traditional holly. This shrub grows to heights of up to 20 feet and works well in dry shade locations under a canopy of mature trees. Gardeners appreciate this shrub for its quick growth rate and its tolerance to many soil types. Yaupon produces non-showy white flowers in spring and orange-hued berries on female plants in fall. This shrub has an upright growing tendency and thrives in zones 7 to 9. St. John's Wort offers another option in a relatively small shrub that grows up to 4 feet tall with showy yellow flowers in the summer. It grows in zones 4 to 8 and forms a rounded mound of dense foliage. Flowers produce on the current year's growth so pruning should occur in early spring. This deciduous shrub attracts birds throughout the year due to the dense foliage shelter and capsule fruit produced in the fall.